Accuracy and visibility are two things a great level needs and the Sola Level Big Red 3 excels at both. With the simple upgrade of a handle, this model can make a serious run at Stabila for my needs as a carpenter. It looks nice, but how does it compare to my Stabila? 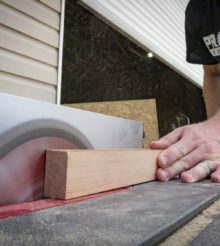 Ask any carpenter to try out a new level and that’s likely his first thought. Even though there are several fine levels on the market, Stabila seems to be the battle-tested champion. With only a few years in the North American market and an unfamiliarity to many tradesmen, can the Sola level “level” the playing field in its Big Red 3 form? We’re going to find out. I’ve been installing cabinets and trimming out a spectacular new home over the last two years and there’s still much more to do. 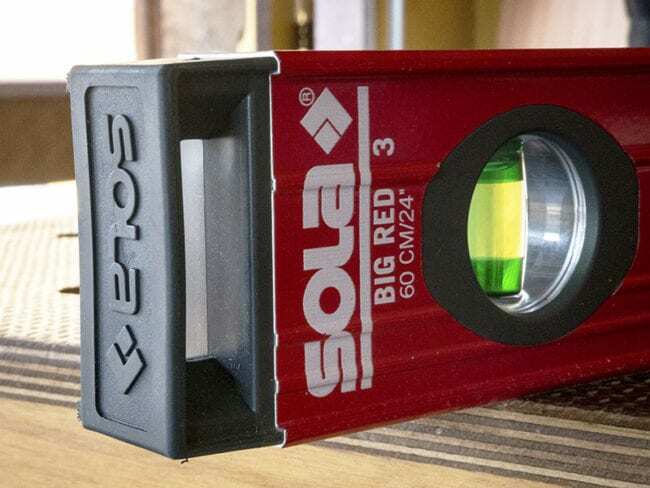 By focusing on high accuracy and visibility, the Sola Big Red 3 makes an excellent general purpose level for just about any Pro. Sola Big Red 3 has been a European designation with the US market getting models under the Big Red name only. The Big Red 3 comes in standard, magnetic, and digital versions. One of the most compelling claims Sola makes is that this is “the most accurate box beam levels in the world” with their 0.30 mm/m accuracy rating. In US measurements, that converts to 0.0003 in/in – 40% more accurate than our 0.0005 in/in baseline Pro standard. As a point of interest, the vials are slightly less accurate in an inverted position (0.0005 in/in). Those accuracy ratings are identical to the current Sola Big Red models sold in the US market. So what else sets this Sola level apart? It has to be the remarkably big vials with shaded ends instead of lines. They are much easier to see. Level manufacturers have experimented with color combinations and contrast to improve visibility. But Sola had a bright idea: just make the vials and air bubbles bigger. The shaded areas that replace the traditional bubble lines hug the ends of the bubble tightly. This creates not only a sharp contrast but also very little margin for user error. I tested the Sola’s accuracy against my Stabila and found it to be dead-on. Although this Sola Big Red 3 level is short, I wish it had a handle like its longer brethren. My 16-inch Stabila has one that I use all the time. I’d even swap out my Stabila for this Sola level with that feature. There’s something I didn’t think I’d say at the beginning of this review. You don’t have to go much bigger to get them, though. 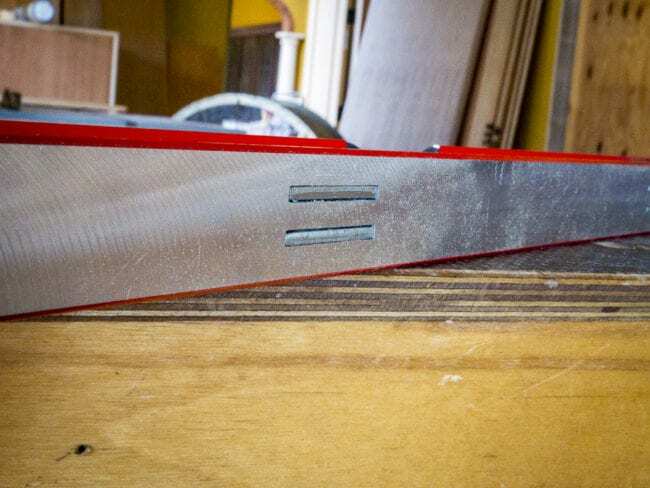 Sola puts handles on starting with their 32-inch lengths. I like the Sola’s rubber end caps better than my Stabila. Although I’ve seen some Pros remove them, I leave them on. The Stabila’s rubber bumpers degrade and crumble off. I haven’t had the Sola long enough to observe the long-term performance of its end caps, but it seems to be made from tougher stuff. I don’t often need those rare-earth magnets since I work primarily with wood. But every so often I work with metal door jambs and such. It’s nice to have magnets in those cases, and the Sola’s are plenty strong enough. What’s more: dirt, dust, and metal shavings are easy to clean from around this level’s magnets. With my Stabila, I’ve found it a little harder to do that. The Sola Big Red 3 will set you back about $80 for the 48″ model. We expect the 24″ to be closer to $50, which is quite a bit less than the Stabila 37424 Type 196 (which has two handholds, by the way). But it’s a hefty premium over the Empire em75.24 at $35. The question is whether the strength of the Sola’s vials, along with its other attributes, commands that price. As a premium level, it does.